Using KNORR Potato Flakes gives a crispy gluten free batter, that fries perfectly to a golden crunch. Whisk in the egg whites. Use chilled water to thin mix if needed. Coat the Squid with the batter and then gently place in deep fryer too cook until golden brown. In a bowl mix the HELLMANN'S Real Mayonnaise with the KNORR Thai Sweet Chilli Sauce GF (portion into ramekins). 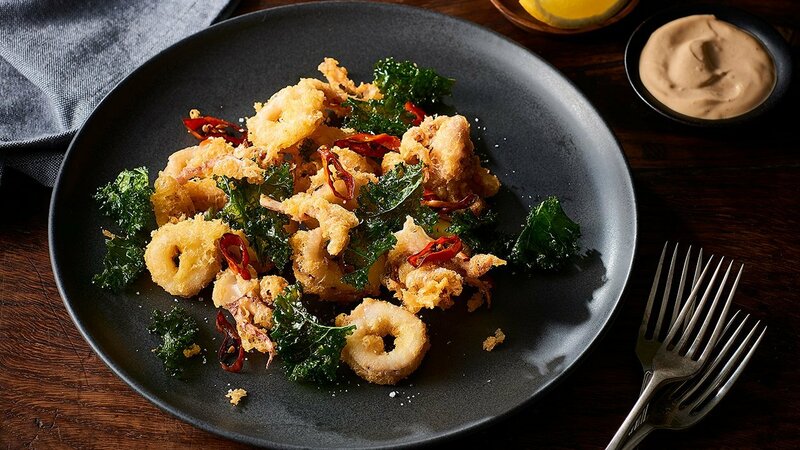 To assemble, arrange the squid, kale and chilli on plate. Finish with lemon and a portion of sauce on the side.